This section deals with discussion of data, design considerations and regulatory issues. This section entails general concepts of biological treatment and nitrification in lagoons and ponds. Lagoons are pond-like bodies of water or basins designed to receive, hold, and treat wastewater for a predetermined period of time. If necessary, they are lined with material, such as clay or an artificial liner, to prevent leaks to the groundwater below. In the lagoon, wastewater is treated through a combination of physical, biological, and chemical processes. Much of the treatment occurs naturally, but some systems use aeration devices to add oxygen to the wastewater. Aeration makes treatment more efficient, so that less land area is necessary. Aerators can be used to allow existing systems to treat more wastewater. Lagoons must be individually designed to fit a specific site and use. Designs are based on such factors as type of soil, amount of land area available, and climate. An important design considerations for lagoons includes the amount and type of wastewater to be treated and the level of treatment required by regulations. Wastewater leaving a lagoon may require additional treatment, or "polishing," to remove disease-causing organisms or nutrients from the wastewater before it can be returned to the environment. If surface applied to crops or grassland in Indiana, a land application permit is needed from the Indiana Department of Environmental Management. There are several different terms for lagoons. For example, the terms lagoon and pond are often used interchangeably, and names, such as polishing, stabilization, and maturation, can refer to a lagoon's particular role in treatment. This can be very confusing for community leaders and homeowners trying to evaluate lagoon systems. The following is a brief overview of some of the more common types of lagoons. The word anaerobic means "without oxygen", which describes the conditions inside this type of lagoon. Anaerobic lagoons are most often used to treat animal wastes from dairies and pig farms, commercial or industrial wastes, or as the first treatment step in systems using two or more lagoons in a series. 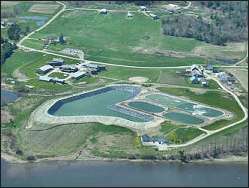 Typically, anaerobic lagoons are designed to hold and treat wastewater from 20 to 150 days. * They are relatively deep (usually 8 to 15 feet) and work much like septic tanks. Inside an anaerobic lagoon, solids in the wastewater separate and settle into layers. The top layer consists of grease, scum, and other floating materials. If not preceded with septic tanks, the layer of sludge that settles at the bottom of an anaerobic lagoon eventually accumulates and must be removed. The wastewater that leaves an anaerobic lagoon will require further treatment. Odor can be a problem with anaerobic lagoons. However, in many cases odor can be managed through a variety of methods, such as adding sodium nitrate, recirculating pond effluent, and through regular maintenance. 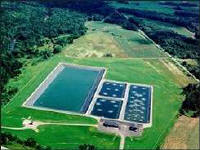 Wastewater treatment takes place naturally in many aerobic lagoons with the aid of aerobic bacteria and algae. Because they are so shallow, their bottoms need to be paved or lined with materials that prevent weeds from growing in them. Sometimes, the wastewater in aerobic lagoons needs to be mixed to allow sunlight to reach all of the algae and to keep it from forming a layer that blocks out the air and sun. Veazie Sanitary District's aerated lagoon system. Aerated lagoons are common in small communities. These systems use aerators to mix the contents of the pond and add oxygen to the wastewater. They are sometimes referred to as partial-mix or complete-mix lagoons depending on the extent of aeration. 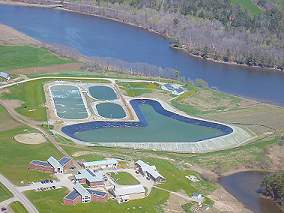 Partial-mix aerated lagoons are often anaerobic lagoons that have been adapted and upgraded to receive more wastewater. With the exception of wind-driven designs, most aerators require energy to operate. However, energy costs are almost always considerably less than those for other mechanical treatment systems. Aeration makes treatment more efficient, which offsets energy costs in some cases. Aerated lagoons require less land area and shorter detention times. *Exact detention times for wastewater in lagoons are based on factors such as the particular design, the amount of wastewater to be treated, and the level of treatment desired. Continuous Discharge Lagoons. 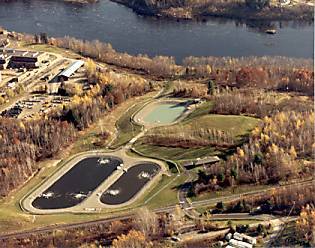 These lagoons release wastewater continuously to a holding pond, so the rate of output roughly equals the rate of input. The hydraulic flow pattern in the lagoon is designed so the wastewater remains in the lagoon long enough to receive treatment before it reaches the outlet. Controlled Discharge Lagoons. In these lagoons, wastewater is discharged in controlled amounts, usually once or twice per year. This method is common in cold climates where discharges typically occur after spring thaw and again in fall. Hydrograph Controlled Release Lagoons. This design can be used for lagoons that discharge directly to surface water. It includes devices that measure the level and quality of the wastewater and receiving water and the velocity of the receiving water to determine when conditions are most favorable for discharge. This method can sometimes eliminate the need for further treatment. Complete Retention Lagoons. These lagoons are only practical in very dry climates where evaporation rate greatly exceeds rainfall amounts. Wastewater is never released from this type of lagoon. Instead it is allowed to evaporate. Lagoon systems can be cost-effective to design and construct in areas where land is inexpensive. They use less energy than most wastewater treatment methods. They are simple to operate and maintain and generally require only part-time staff. They can handle intermittent use and shock loadings better than many systems, making them a good option for campgrounds, resorts, and other seasonal properties. They are very effective at removing disease-causing organisms (pathogens) from wastewater. The effluent from lagoon systems can be suitable for irrigation (where appropriate), because of its high-nutrient and low pathogen content. Lagoon systems require more land than other treatment methods. They are less efficient in cold climates and may require additional land or longer detention times in these areas. Odor can become a nuisance during algae blooms, spring thaw in cold climates, or with anaerobic lagoons and lagoons that are inadequately maintained. Unless they are property maintained, lagoons can provide a breeding area for mosquitoes and other insects. They are not very effective at removing heavy metals from wastewater. Many community systems are designed with more than one lagoon in a series, in parallel, or both. This is because two or more small lagoons can often provide better quality treatment than one large lagoon. Multiple lagoons are less common in systems designed for individual households. In systems that employ more than one lagoon, each lagoon cell has a different function to perform, and a different kind of lagoon design may be used for each cell. When lagoons operate in series, more of the solid material in the wastewater, such as algae, has an opportunity to settle out before the effluent is disposed of. Sometimes serial treatment is necessary so the effluent from lagoon systems can meet local requirements. Some lagoon systems are designed to use more cells during the summer months when algae growth is highest. In parallel means that a system has more than one cell that is receiving wastewater at the same stage of treatment. This system design is particularly useful in cold climates or where lagoons are covered with ice for parts of the year. Because biological processes are involved, wastewater treatment slows down in cold temperatures, making treatment less efficient. Parallel cells are often used during winter months to handle extra loads. Like most natural environments, conditions inside facultative lagoons are always changing. Lagoons experience cycles due to variations in the weather, the composition of the wastewater, and other factors. In general, the wastewater in facultative lagoons naturally settles into three fairly distinct layers or zones. Different conditions exist in each zone, and wastewater treatment takes place in all three. The top layer in a facultative lagoon is called the aerobic zone, because the majority of oxygen is present there. How deep the aerobic zone is depends on loading, climate, amount of sunlight and wind, and how much algae is in the water. The wastewater in this part of the lagoon receives oxygen from air, from algae, and from the agitation of the water surface (from wind and rain, for example). This zone also serves as a barrier for the odors from gases produced by the treatment processes occurring in the lower layers. The anaerobic zone is the layer at the very bottom of the lagoon where no oxygen is present. This area includes a layer of sludge, which forms from the solids that settle out of the wastewater. Here, wastewater is treated by anaerobic bacteria, microscopic organisms, such as certain protozoa, and sludge worms, all of which thrive in anaerobic conditions. Names for the middle layer include the facultative, intermediate, or aerobic-anaerobic zone. Both aerobic and anaerobic conditions exist in this layer in varying degrees. Depending on the specific conditions in any given part of this zone, different types of bacteria and other organisms are present that contribute to wastewater treatment. Throughout facultative lagoons, physical, biological, and chemical processes take place that result in wastewater treatment. Many of these processes are interdependent. For example, on the surface, wind and sunlight play important roles. Surface agitation of any kind adds oxygen to the wastewater. For this reason, facultative lagoons are designed to make the best use of wind in the area. The amount of wind the lagoon receives is not only important for the oxygen it contributes, but also because it affects the overall hydraulic flow pattern of the wastewater inside the lagoon, which is another physical factor that contributes to treatment. Time is another important factor in treatment. Facultative lagoons are designed to hold the wastewater long enough for much of the solids in the wastewater to settle and for many disease-causing bacteria, parasites, and viruses to either die off or settle out. Time also allows treatment to reduce the overall organic strength of the wastewater, or its biochemical oxygen demand (BOD). In addition, some of the wastewater eventually evaporates. Sunlight is also extremely important to facultative lagoons because it contributes to the growth of green algae on the water surface. Because algae are plants, they require sunlight for photosynthesis. Oxygen is a byproduct of photosynthesis, and the presence of green algae contributes significantly to the amount of oxygen in the aerobic zone. The more warmth and light the sun provides, the more green algae and oxygen there is likely to be in the lagoon. The oxygen in the aerobic zone makes conditions favorable for aerobic bacteria. Both aerobic and anaerobic bacteria are very important to the wastewater treatment process and to each other. Bacteria treat wastewater by converting it into other substances. Aerobic bacteria convert wastes into carbon dioxide, ammonia, and phosphates, which, in turn, are used by the algae as food. Anaerobic bacteria convert substances in wastewater to gases, such as hydrogen sulfide, ammonia, and methane. Many of these by-products are then used as food by both the aerobic bacteria and algae in the layers above. In addition, the sludge layer at the bottom of the lagoon is full of anaerobic bacteria, sludge worms, and other organisms, which provide treatment through digestion and prevent the sludge from quickly accumulating to the point where it needs to be removed. How often sludge must be removed from facultative lagoons varies depending on the climate, the individual lagoon design, and how well it is maintained. Sludge in all lagoons accumulates more quickly in cold than in warm temperatures. However, many facultative lagoons are designed to function well without sludge removal for 5 to 10 years or more. Certain site-related factors, such as the location of the water table and the composition of the soil, always must be considered when designing lagoon systems. Ideally, lagoons should be constructed in areas with clay or other soils that won't allow the wastewater to quickly percolate down through the lagoon bottom to the groundwater. Otherwise, lagoons must be artificially lined with clay, bentonite, plastic, rubber, concrete, or other materials to prevent groundwater pollution. Special linings usually increase system costs. Most areas in the U.S. have laws concerning the siting of lagoons, including their distance from groundwater below, and their distance from homes and businesses. Lagoons also should be located downgrade and downwind from the homes they serve, when possible, to avoid the extra cost of pumping the wastewater uphill and to prevent odors from becoming a nuisance. The amount and predominant direction of wind at the site is another important factor, and helps to determine the lagoon's exact position. 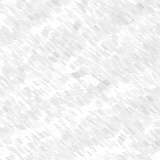 Any obstructions to wind or sunlight, such as trees or surrounding hillsides must be considered. Trees and weed growth around lagoons should be controlled for the same reasons. In addition, water from surface drainage or storm runoff should be kept out of lagoons, if necessary install diversion terraces or drains above the site. The exact dimensions of lagoons vary depending on the type of processes they use for treatment, the amount of wastewater that needs to be treated, the climate, and whether other lagoons or other types of treatment are also being used. The size and shape of lagoons is designed to maximize the amount of time the wastewater stays in the lagoon. Detention time is usually the most important factor in treatment. In general, facultative lagoons require about one acre for every 50 homes or every 200 people they serve. Aerated lagoons treat wastewater more efficiently, so they tend to require anywhere from one-third to one-tenth less land than facultative lagoons. Many partial-mix aerated lagoons are simply former facultative lagoons that have been adapted to receive more wastewater. Lagoons can be round, square, or rectangular with rounded corners. Their length should not exceed three times their width, and their banks should have outside slopes of about three units horizontal to one unit vertical. This moderate slope makes the banks easier to mow and maintain. In systems that have dikes separating lagoon cells, dikes also should be easy to maintain. Interior bank and dike slopes are determined by the size and depth of the lagoon, potential wave action and other factors. The bottoms of lagoons should be as flat and level as possible (except around the inlet) to facilitate the continuous flow of the wastewater. Keeping the corners of lagoons rounded also helps to maintain the overall hydraulic pattern in the lagoons and prevents dead spots in the flow, called short-circuiting, which can affect treatment. Facultative lagoons are designed to hold wastewater anywhere from 20 to 150 days, depending on the discharge method and the exact size and depth of the lagoon. Aerated lagoons tend to require shorter detention times to treat the same amount of wastewater. In cold weather, however, biological treatment processes in all lagoons slow down, making longer detention times necessary. Facultative lagoons are usually 3 to 8 feet deep, so they have enough surface area to support the algae growth needed, but are also deep enough to maintain anaerobic conditions at the bottom. Water depth in lagoons will vary, but a minimum level should always be maintained to prevent the bottom from drying out and to avoid odors. Partial-mix aerated lagoons are often designed to be deeper than facultative lagoons to allow room for sludge to settle on the bottom and rest undisturbed by the turbulent conditions created by the aeration process.